Dear yogis, I’m very happy & excited to announce that the wonderful La Sagesse Intérieure studio is available & offers the studio rent free in order to participate in World Yoga Day 2013: 24 February from 11AM-1PM ! It’ll be a full hatha yoga class, with meditation & chanting. The yoga class, which is on a donation basis. Give whatever you can spare, all proceeds go to the NGO FIAN International, the chosen charity for this event. It would be wonderful if we could share a potluck lunch after the class, so feel free to bring a snack or dish of your choice, make it a yogi one so we stay in the spirit of yoga (vegetarian). There’s space for 12 students in the class, maybe 14 if we squeeze our mats close together. So kindly register beforehand via e-mail and/ or Facebook. If you live in 1000 Brussels, you can also join the charity class in Sampoorna Yoga Studio. Looking forward to welcoming you on Sunday 24 February, please be there at least 5 minutes before the start of the class. Categories: Meditation, Yoga classes, Yoga info | Tags: charity, donation, FIAN, WYD2013 | Permalink. This week, I’ve started an evening course (5 times, once every 3 weeks) on food sovereignty @ Rencontre des Continents in Brussels. We don’t really ask ourselves a lot of questions as to where our daily food comes from (from production, to transformation & distribution), but we should. The course will elaborate on the impacts of our everyday decisions as to what we put on our plate and how these have direct effects on the planet & people. The course strives to provide us with knowledge & tools in order to make ethical and well-informed decisions every time we consume (literally) in order to have a much needed (collective) positive impact on the ecosystem of food. All the students brought some food to share (potluck style) & luckily there was no meat or fish at all! Just some dairy which I could easily avoid as everyone was very informative about what they brought. As a practical assignment we prepared different vegetable spreads. 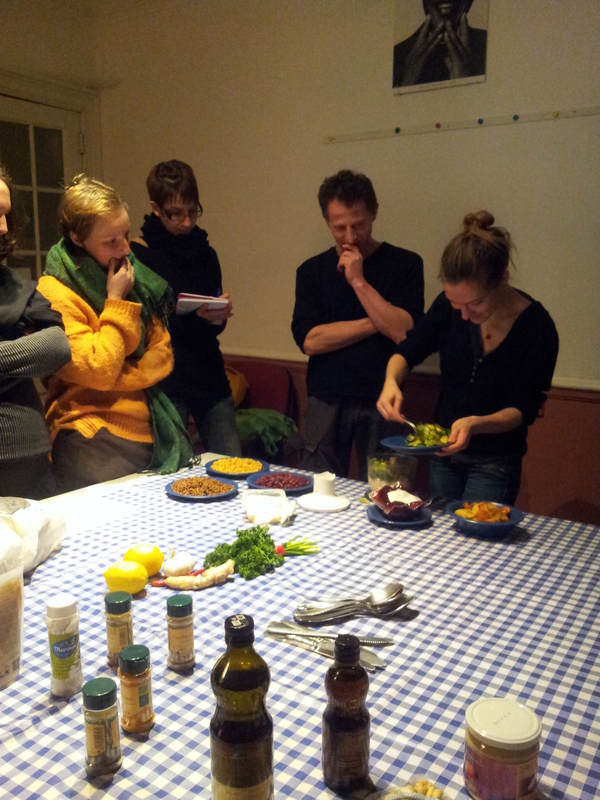 There were 4 groups of ingredients: legumes (pulses), vegetables (cooked beetroots, carrots, parsnip, leek), oils & nuts, spices, herbs & condiments (lemon, red pepper, ginger root, tamari, white sweet miso, fresh garlic & parsley), all organic! 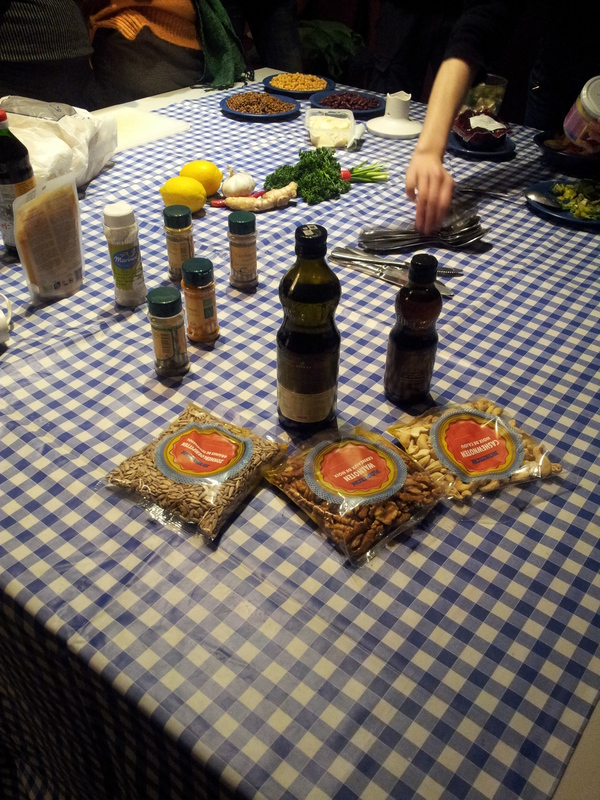 We had to prepare a vegetable spread with at least one ingredient out of all groups. It was a lot of fun, as we formed smaller groups and discussed which flavors would go well together, a lot of improvisation went on there! 1/3 of pulses & 2/3 of vegetables is recommended & the wet ingredients first to make it easier to blend (blades are at the bottom). 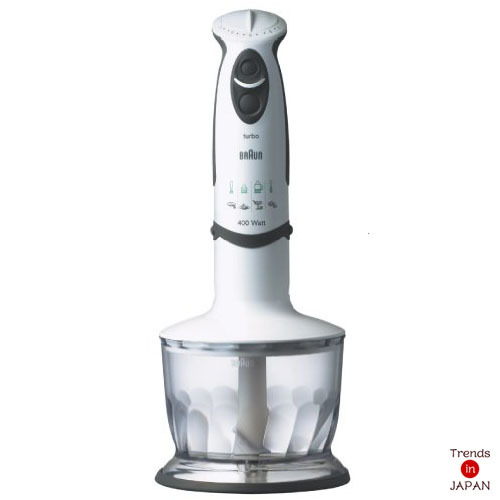 You blend it all to a smooth texture in a simple hand blender, i.e. this one by Braun that I use. PS: garlic is not considered sattvic food in yoga, so I prefer to stay abstain from it. It’s a great exercise as you simply try to combine flavors & it basically always works! It’s delicious as a spread on bread or with a green salad & a full meal as you combine all the food groups to a perfectly balanced meal (carbohydrates, proteins, fats, minerals, vitamins). Soon I’ll share more about the theory & the other recipes we’ll create. The next session is in 3 weeks. 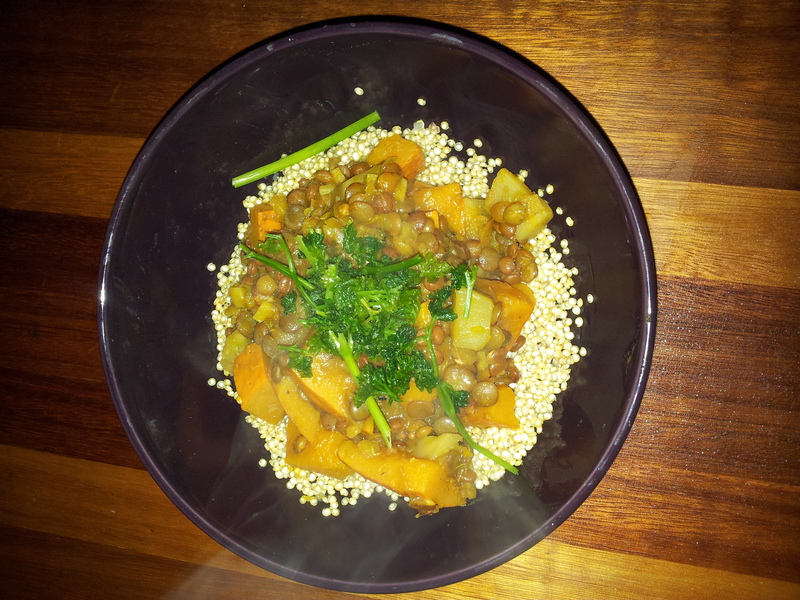 Categories: Yogi food | Tags: food sovereignty, pulses, sattvic, spread, vegan, vegetable | Permalink.